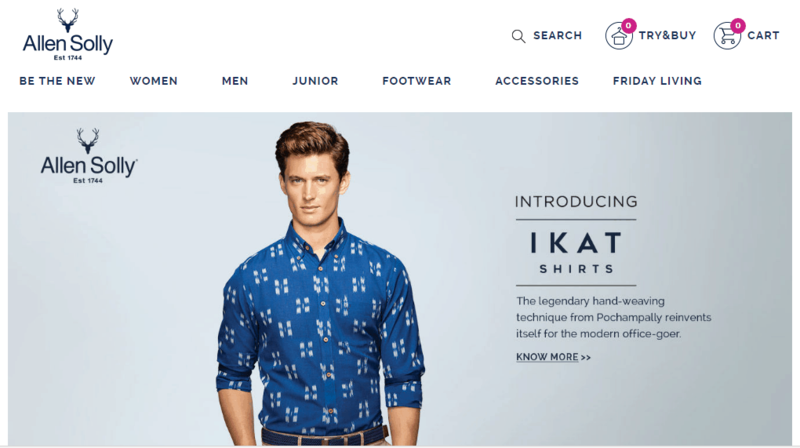 CASE STUDY: How Allen Solly Revolutionized The Indian Formal Attires? Home > Blog > Blog > CASE STUDY: How Allen Solly Revolutionized The Indian Formal Attires? Allen Solly is a brand that transformed the dressing lifestyles of Indian officials. Allen Solly was the modernizer in bringing the semi-formal revolt to the Indian market. It netted the imagination of youth and professionals equal giving them a chance to mark a fashion statement at work. The brand has progressed swiftly in the past years, becoming one of the fastest growing brands in India. Allen Solly was founded in 1744 by William Hollin and Co Ltd. The brand was bought in the 90’s by a company called Madura Garments. Madura Garments was a part of Madura Coats and a big producer of threads. Aditya Birla Group acquired Allen Solly in 2001. Allen Solly accomplished a proximate fashionable position in a highly competitive readymade market within a short span of time. Allen Solly comes into the market with the hit idea of “Friday Dressing”. Allen Solly launched office apparels in colored shirts and Khaki trousers which became a prompt hit. A brand tagline “My World, My Way” was formed to show the brand’s new trend. In 2002, Allen Solly became the first Indian brand to introduce work fashion for women. In 2013, the kid’s apparel was expanded into a complete smart young wardrobe, “Allen Sally Junior” for boys and girls. Solly Jeans Company was launched in 2014 and Solly Sport was introduced as a tennis-inspired lifestyle sports brand. Allen Solly ad campaignings are equally spread in print as well as digital media. The print media has sold Allen Solly as new age brand of comfortable formal apparels. The one step of Allen Solly was to broadcast the same message through TV ad. The next step was to promote the same message through social media platforms. Allen Solly has a considerable presence on Facebook, Twitter, and Instagram, and is slightly active on YouTube. Allen Solly has 16.6K followers on Twitter, 13.6K followers on Instagram and sizeable 1.7 billion likes on its Facebook Page. Though the brand sells products for men & women, their social media content is profoundly targeted towards women. Allen Solly uses a smart combination of digital outdoor and social media that help to promote local brands. Allen Solly promotes their brand on Facebook which helps to engage their fans in meaningful conversations and co-creation. The brand connect on Facebook is entirely in line with the newly available theme. The best thing about Allen Solly is that they aim to sell the idea itself and not just the product. Allen Solly is using the content to sell their positioning. Allen Solly with India’s first Twitter-powered billboard that is spreading shirts to the tweeting audience. In a colossal billboard, 52 shirts were placed. Behind each shirt, boards were arranged with a solenoid. With every tweet with a significant #, a random solenoid would inch forward, ultimately striking each shirt from the billboard, right into the hands of the lucky tweeters that were waiting under the billboard to catch their prize. Allen Solly has the campaign to take forward the concept of ‘Friday Dressing’. The film targets to imbue the casual spirit of a Friday on any day of the week and make work less stressful. Allen Solly follows a unique model of brand growth and values outlets and mixed stores alike. The apparels can be located in Malls as well as Retail Stores. The brand, at present, retailed from 207 exclusive stores across India and with the plans of International Expansion; the number is going to increase very soon. In last fiscal, its revenue mounted at INR 600 crore. The company has been growing aggressively at a CAGR of 34% and stands poised to cross net sales of INR 1,000 crores in FY 2017. The flawless branding and the remarkable apparels are what attract most consumers to the retail outlets of Allen Solly. With the rise of E-commerce, consumers will also find Allen Solly apparels being sold online in massive numbers.